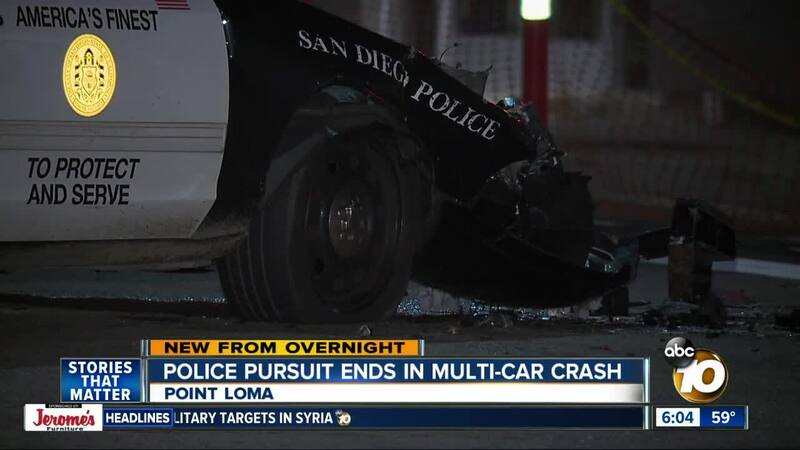 SAN DIEGO (CNS) - Three San Diego police patrol vehicles were damaged Monday during a brief pursuit of a suspected drunken driver in the Point Loma Heights area. Officers attempted to pull over a motorist for driving an SUV without license plates around 1:20 a.m. in the 4100 block of Voltaire Street, but the driver took off, according to San Diego police. The SUV driver was traveling through the Point Loma Heights neighborhood when officers in two police patrol cars responding to the chase collided with each other while making a U-turn, Lt. Andra Brown said. The pursuit continued until the SUV driver struck a third police patrol vehicle then crashed into another vehicle, Brown said, adding that the driver of the other vehicle was treated at the scene for minor injuries. The SUV driver got out of the vehicle and attempted to flee on foot down an embankment to Nimitz Boulevard, but officers caught up to him and took him into custody, Brown said. The 45-year-old man, whose name was not immediately available, was arrested on suspicion of DUI, felony evading and hit-and-run, Sgt. Thomas Sullivan said.